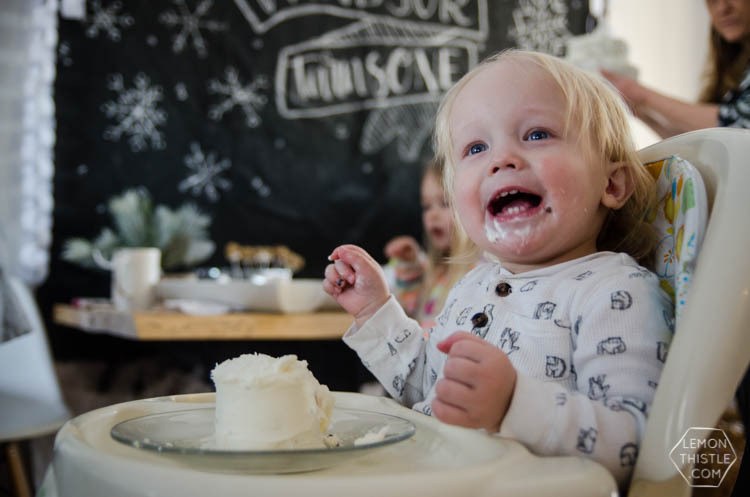 Another kiddo birthday party is coming your way- I just can’t get over how fast time seems to fly with little kids underfoot. They just don’t slow down and I feel like I haven’t been a parent long enough to have three of them. 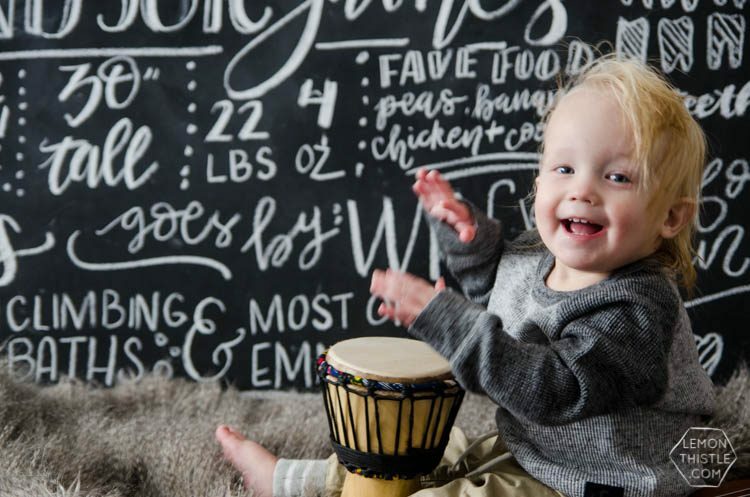 Yet… the baby is ONE! How does that even happen? I really really love how this party turned out- it checks all of my happy boxes, you guys. It was affordable, it looks rad, and it is all about black and white. 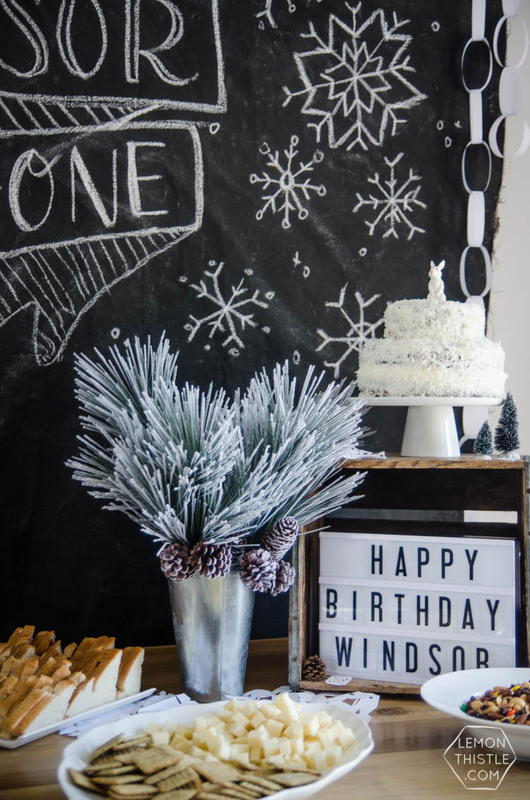 I thought it would be really fun to do a winter theme since his birthday is over the holidays BUT I am so not a fan of glitter and baby blue snowflakes- I’m just not. I wanted to make it a bit more boyish and bring it in to my modern rustic style with tons of black and white. 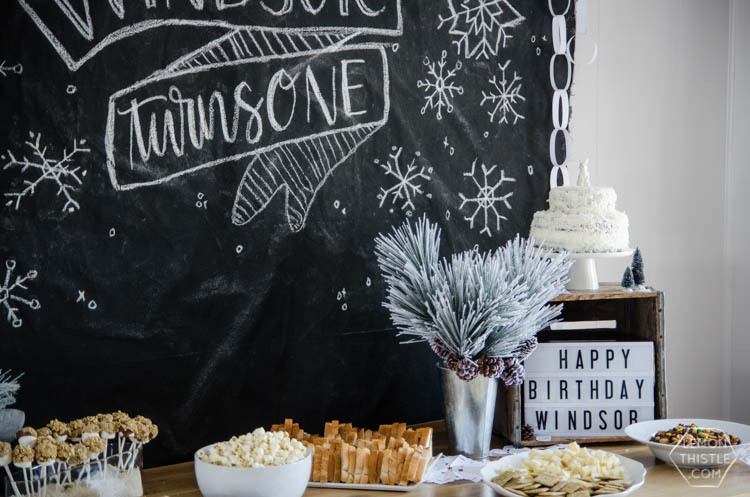 I love the way this rustic modern winter wonderland or ‘ONE’derland turned out! 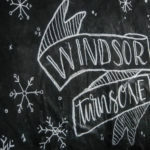 The twins actually wanted to call it a ‘Windsor ONEderland’ and Shane and I died laughing- they’re so clever! 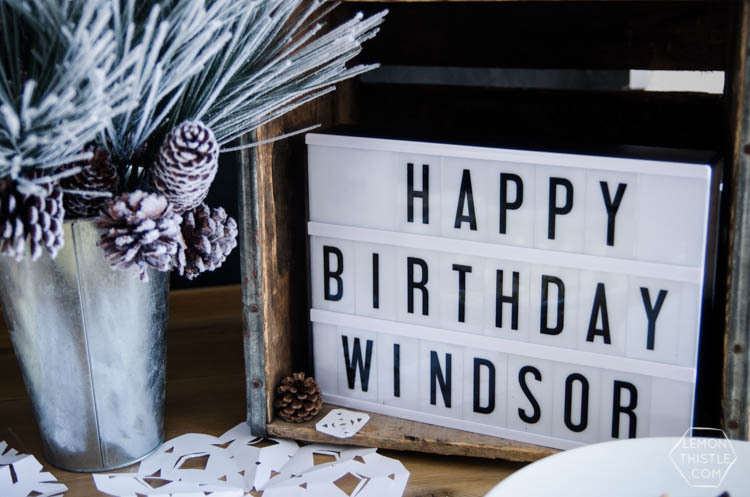 Today I’m going to chat you through some of the details, share lots of pictures (including a super reluctant cake ‘smash’), and then next week I’ll be back with a video tutorial on that backdrop! 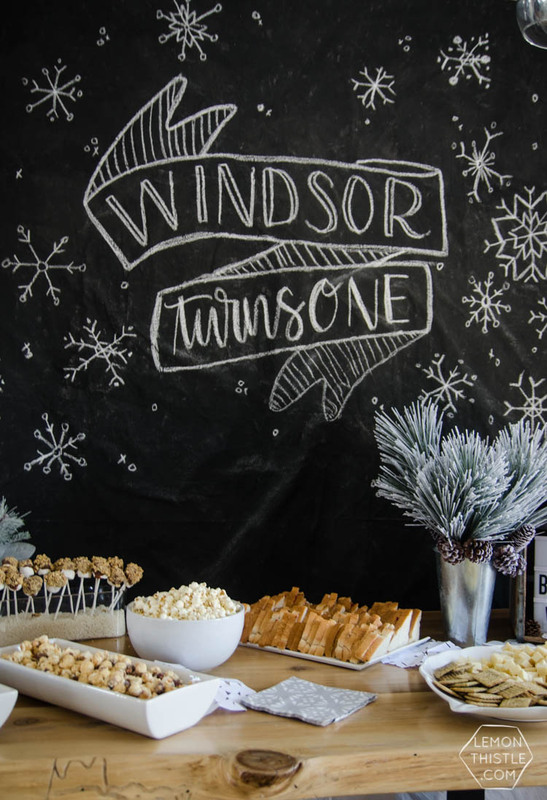 Okay, so first off… what makes me most happy about this party is I didn’t spend a cent on decorations… I used things that I already had. So I spent some money on some food and treats but this party was pretty darned affordable- WIN. So where did all this stuff come from? 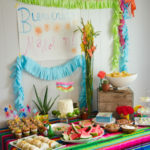 My favourite way to decorate a party and fill up a table with pretty stuff is to raid my home. I know that you like where that vase or candle or whatever is and don’t want to move it BUT you can put it back tomorrow… really. 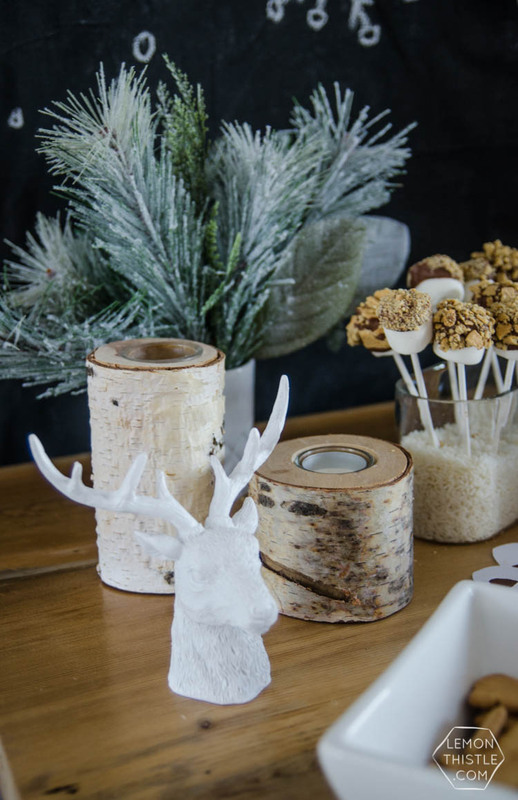 And you can find some unconventional stuff in your home that you already find beautiful that maybe you wouldn’t normally use as party decorations but the texture or shape work with your theme. For example… that crate! I use it to store binders and notebooks under my desk. 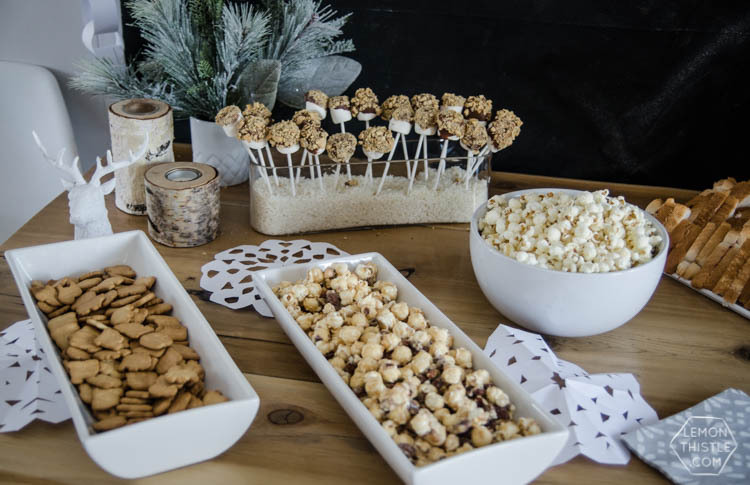 And yes, it’s a bit of a pain to empty them out… but you can put them right back in after the party. Another weird one? That deer head. It’s actually a stacking buck game. But it fits the theme, it’s the right color, and did anyone question it? Nope! Other things I grabbed from around the house are those birch candle holders, that white vase (an old candle container), my metal planter, and my My Cinema Lightbox. Plus, since Christmas is over, I pulled from my holiday bins- those flocked sprays are pieces I use in my Christmas tree- same as those mini bottlebrush trees. And that cake topper? Yeah, that’s my kiddos’ toy- but it works! 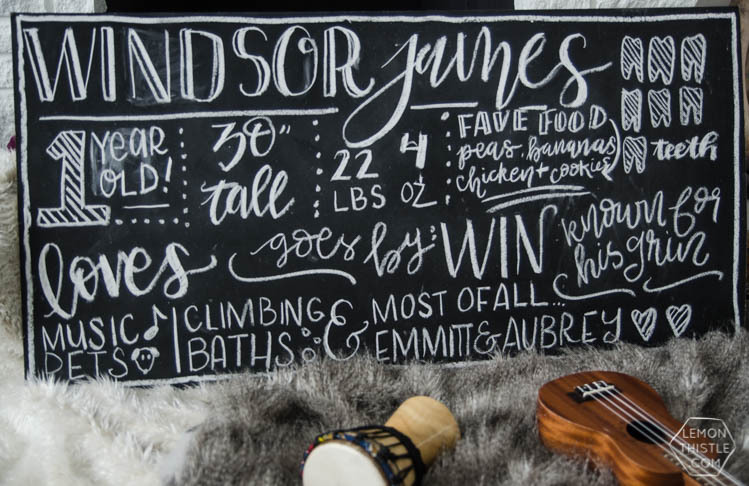 The last thing I already had on hand that you might need to make is that giant chalkboard I used for his milestones chalkboard. I made these with a frame when the twins turned one and love looking back at the pictures of them with their chalkboards- it’s such a representation of where they are at that age. I used one of them with the frame off for a more modern look and just used chalk to letter some of his stats and favourite things. I LOVE the photos of him in front of them. He’s such a mover though, I had to keep throwing him toys to keep him there long enough to snap a few photos! My other tip is to get crafty… but that’s always my answer. That backdrop is actually just a drop cloth I painted out black. It was leftover black paint from my understairs hideout. Maybe you won’t have black paint so you need to buy it BUT keep in mind that this drop cloth backdrop isn’t trash when you’re done… it still works as a drop cloth. So fold it back up and put it with your paint brushes. And nope, it doesn’t need to be a brand new drop cloth… black paint will cover all your splatters, promise ;) But enough on that- I’ll be doing a video tutorial for that next week! The other crafty things were all made with printer paper (which we always have). The kids and I sat down and played with scissors and glue and they helped me (I use the term ‘help’ loosely!) 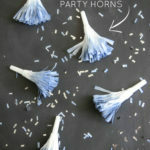 make paper snowflakes and paper chains. They loved telling people that they helped make the decorations. The last thing I wanted to say is to keep the food simple! I know this isn’t decor related but, seriously… people won’t mind if you don’t make every single thing from scratch using a unique Pinterest recipe. 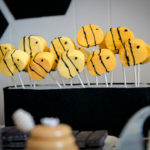 We made those marshmallow pops (my 3 year olds actually made them, I just popped the marshmallows on the stick for them), the cake (using cake mix and premade icing- I’m fancy like that- and I got SO many compliments on this cake), and PB & J sandwiches but other than that… dump those snacks in a bowl and you’re done! Okay last word on this cake… do you recognize it? 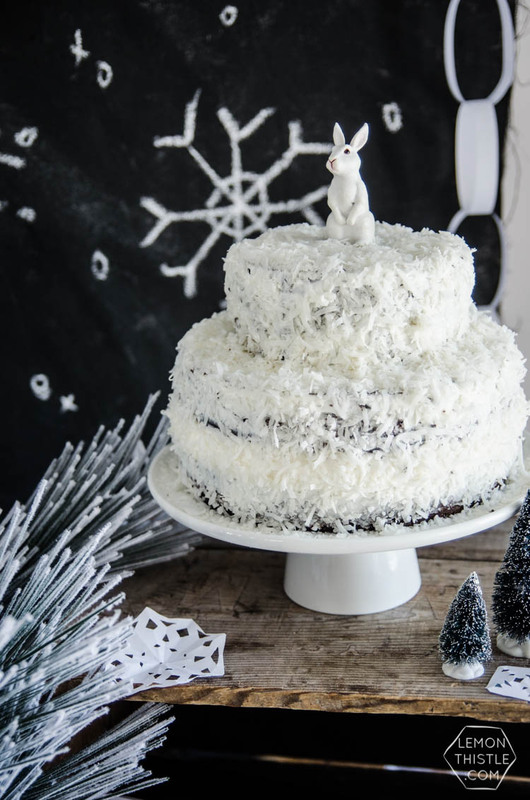 Last year I showed how I use coconut to spiff up a grocery store cake to a beautiful winter scene. 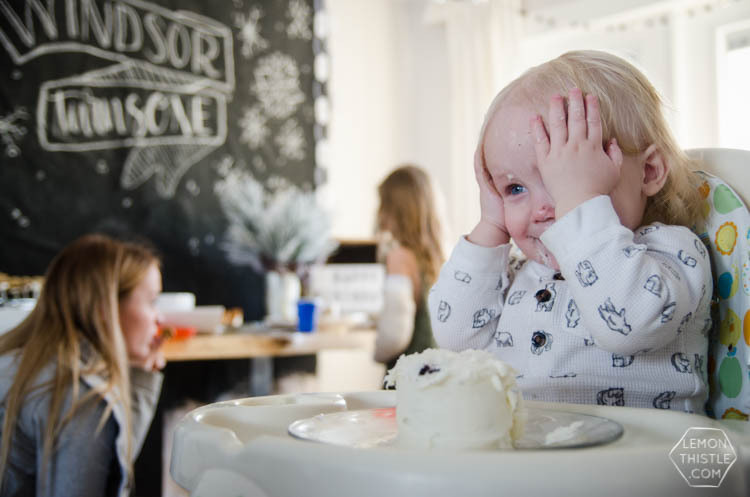 I did the exact same thing with this guy once I made the cake. 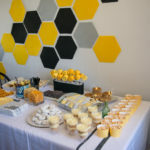 I hope you enjoyed checking out the party and seeing how you can take a classic theme and give it a twist to totally suit your style for not a lot of money. It was probably the LEAST work I’ve done for a party but it’s one of my total favourites. 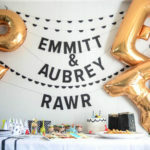 If you want to check out all of my rad party ideas RIGHT HERE, but I’ve also picked out a few that you might like below! What a beautiful party! Everything looks amazing. 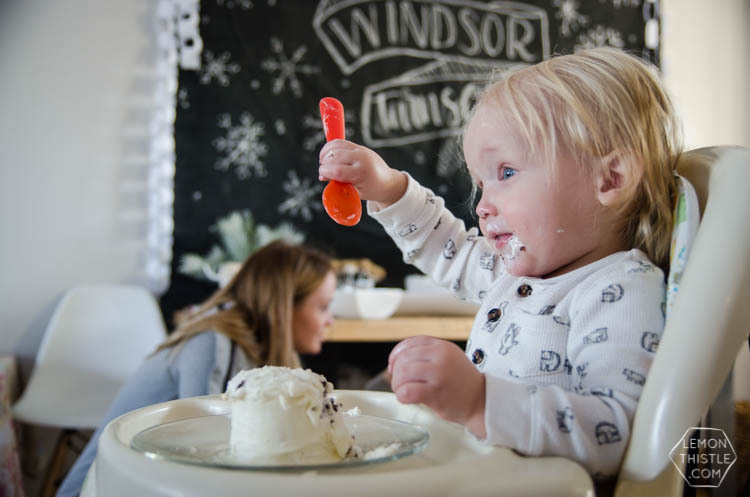 I love, love the backdrop, and your rustic black and white decor looks amazing. Great tips. Thanks so much Dannyelle! 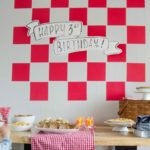 That backdrop was so much fun to create I already have it set aside for another party this weekend!